Holiday Cottages B&B in the South Hams | Bed & Breakfast in Dartmouth Kingsbridge, Devon. Old " The Barley House" page . Devon's South Hams area from Plymouth to Dartmouth and Kingswear, is a stunning Coastal region with amazing Views over gently rolling countryside, River valleys and beautiful headlands and bays, including Bolt Head and Start Point. The two headlands of Bolt Head and Start Point are located either side of the entrance to the Salcombe Estuary, an area known for the stunning views over the water and the quality of the surrounding coast line and countryside. The Village of Hope Cove, is tucked away in the lee of Bolt Head, giving it a sheltered location with sandy beaches right next to the village centre overlooking the sea and coastline and has some of the most delightful coastal walks. Salcombe is a major yachting centre, with many boats making their way in and out of the estuary in the main season - creating a constantly changing backdrop to the streets of the town. Salcombe, itself, is a picturesque holiday location, with two main family beaches. Salcombe offers a good range of shops along the main streets, many with a nautical/sailing theme. The main street has many high quality restaurants and cafes, offering a range of food to suit all palettes and prices. Parking can be difficult in the main season, and it is best to use the main car parks where possible. Plymouth, is a major city, with everything that you would expect from a city of this size and more. Plymouth's coastal location gives the town some unique views across the waters of Plymouth Sound towards the English channel and the open country side of Cornwall, just over the Tamar River. Plymouth has a bright modern shopping centre intermingled with historic buildings from the Elizabethan period. The waterfront in the historic Barbican area is full of life and activity. You can take boat trips around the Harbour and Naval Dockyards from the historic quays on the Barbican, where you will also find the Mayflower Steps, where the Pilgrim Fathers set off for America and the quay where the Tolpuddle Martyr were embarked on their deportation to Australia. The marinas and waterways at Plymouth are always full of movement and activity - Plymouth is a major boating centre as well one of the UKs main naval bases, with Frigates, Assault ships and submarines, regularly sailing in and out of the naval dockyard on the banks of the Tamar river. Dartmouth is a small town at the entrance to the river Dart. Again a major boating centre. This picturesque and historic port, clings to the side of a hill, with main streets running along the river banks. The town features the Royal Naval College and a Tudor castle at the mouth of the river. Boat trips regularly leave the main Town quay taking people up the River dart to Dittisham, or to Totnes Quay. Trips also leave the town taking people out into the Channel and around Berry Head into Torbay. Dartmouth is steeped in history, with narrow streets and alley ways. Like Salcombe, parking is at a premium, so cars are best left in the Park and ride and the top of the town. Dartmouth features two ferry crossings; The upper chain ferry and the lower ferry, which is a pair of tug boats that guide, floating pontoons across the river month. Camping and Touring | Camp sites in Nr Kingsbridge with Sea Views. Alston Farm Camping and Caravan Park is a perfect choice for anyone seeking a country location close to spectacular coastal scenery and the famous beauty spots of Thurlestone, Hope Cove and Salcombe. Ideal for families, diving, walking and birdwatching enthusiasts. At Alston Farm Camping & Caravan Park in Nr Kingsbridge Pets are Welcome - Dog friendly establishment. 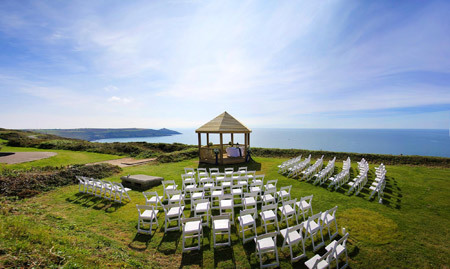 At Weddings in Cornwall at Whitsand Bay Fort in Torpoint Pets are Welcome - Dog friendly establishment. At Notter Mill Country Park in Saltash Pets are Welcome - Dog friendly establishment. Plymouth Self-catering Holiday rental with Sea Views. Self-catering Holiday Caravan accommodation in Plymouth. with Sea Views. 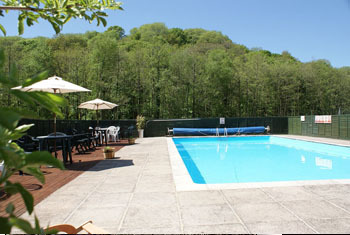 Holidays in Plymouth with the benefit of an onsite swimming pool - to help you enjoy your Holiday in Cornwall. A range of luxury 4* accommodation within an Area of Outstanding Natural Beauty. Bovisand Lodge Estate is delightfully situated in an peaceful rural environment, with spectacular views of Plymouth Sound & the Cornish Coast. Opening onto the S.W Coastal Path, an ideal destination for walkers & nature lovers. Superb indoor heated pool to enjoy. Three charming and beamy converted barns, brimming with character, set in a secluded valley with views across rolling countryside. Just six miles from the seaside, The Stables sleeps four, and The Old Granary�s a cosy treat for two. The Byre sleeps 4. At Lower Collaton Farm in Dartmouth Pets are Welcome - Dog friendly establishment. Tucked away in an exclusive valley in the South Hams youll find six pretty holiday cottages, sleeping 2 - 6. Our great location means we are close to beautiful beaches, Slapton village, Salcombe and Dartmouth, with great walking nearby. All cottages have gardens, views, wifi and access to our conservation valley. Dogs welcome. At Dittiscombe Holiday Cottages in Nr. Kingsbridge Pets are Welcome - Dog friendly establishment. Self-catering Holiday Cottage and B&B stays. Holiday Cottage sleeps 2 -Apple Loft Cottage is a delightful self-catering holiday let for two. At Churchwood Valley Holiday Cabins in Plymouth Pets are Welcome - Dog friendly establishment. B&B in the South Hams | Bed & Breakfast in Dartmouth Salcombe Plymouth Devon - stylish and relaxed guest house B&B accommodation and rental in the heart of the South Hams- quality B&B stays for for visitors who want comfortable, contemporary interiors and quality breakfasts, in a peaceful setting. This area of Devon with coast, countryside and moor has something for every taste and is uniquely beautiful with the majority of the area designated as an Area of Outstanding Natural Beauty. Close to Dartmouth, Salcombe and the beautiful South Hams coast and beaches. Devon Online has a number of B&B and Hotel accommodation providers in the South Hams. From Plymouth to Dartmouth, you will find a fascinating region with a unique blend of history, and scenery that is hard to match anywhere in the country, Holiday makers will always have something to do in this area of Devon, from visiting the beautiful sandy coves along the coast or the stunning riverside at Dartmouth with its historic town centre and Naval College, Salcombe or Plymouth, all providing stunning river cruises along the River Tamar, the Salcombe Estuary and the River Dart. B&B and Hotel stays provide an ideal way to discover the delights of this region.